When the iPad came out, i thought it was priced “aggressively”. $500 for the entry level iPad still seems low. Unfortunately there seems to be a trend where some (fickle) people think they should be able to buy sterling technology at bargain basement prices. Love too the tech turd types who think the iPad is a “toy” which is just another convenient & cheap tech cliche like iSheep with no bearing in reality, just fitting someone’s disingenuous rationalization bias. Like apple users aren’t discerning about their tech. Just wanna slap those MF’ers silly. “Ignorak” lol I do find that they keyboard is actually much more expensive than even the, percieved, Apple Taxed one would be! I guess is M$ Tax nowadays! Problem is, there is no place to hide in the pricing structure for MS.
iPad mini- $199 – $299 ??? I’m predicting a RIM/HPalm fire-sale by March for the Surface. I’m pretty sure keeping the iPad 2 around at $399 was a test of lower price points (not IF it would work, but to judge sales volumes and impacts on the flagship model). My guess is we’ll see the iPad mini models at $299 – $399 (or maybe even $449). With the existing 10″ iPad models Apple is already pursuing a strategy of very aggressively pricing, but that doesn’t mean Apple has to chase the Kindle and Android tablets down into the muck in the 7″ market. First lets change the aluminium case to PLASTIC with a sliding slot that allows the battery to be changed. Next, lets change the battery to the one sourced by Crapola Inc. one that dies after 3 months. Next lets replace the Retina display with one that has much less resolution, don’t worry we will just say that it is actually better than the higher definition one and those idiots we want to sell to will believe it. Next, lets put in a real cheap processor. I could go on with the crappy software…..but I’ll stop here. NOW LOOK AT IT. Is that what you want? It looks almost like the surface now. Compare that image with Steve Jobs relaxing in a plush chair using the iPad with one hand. Microsoft comes out with a touch tablet that has a physical keyboard and mouse. Not only that, it has several input interfaces. All it needs to function is a damn good Anti-Virus software suite. If Surface with Windows RT can’t run all my favorite Windows 7 apps like Disk Defragmenter, ScanDisk, Spyware Search, Antivirus Pro, and Registry Cleaner, why would I ever want it? What would I do with it all day? 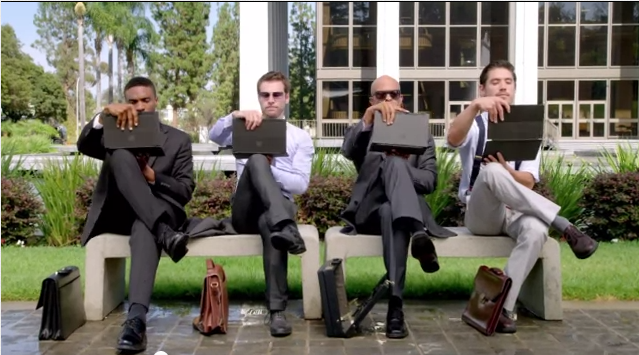 If you’ve seen the commercial they just released you’ll notice that whenever someone uses the Surface, they have it on a table, or bench. I think this is the inspiration for the name, because you can’t use the tablet and its keyboard cover and kickstand (first thing to fall off) without placing it on a surface. Is Microsoft actually pricing the keyboards differently BECAUSE OF COLOR?!? Wow . . . just wow. Dvorak is right that the pricing is a mess, but he’s wrong in one aspect: Microsoft can’t sell the Surface tablets as a loss leader or not make money on them. It simply doesn’t have that luxury. However, why would anyone buy a Surface tablet when the iPad is available right next to it and is much better? I can’t wait for the reviews of the Windows 8 version to come out and constantly complain about how slow it runs and how the battery dies after a couple of hours. This actually makes me nervous that, against all reason, the Surface will be an iPad killer. Dvorak is simply so bad at forecasting the future that I take the opposite of what he says as gospel truth. Please, there are many crazy people out there – but not THAT many. The iPad will be fine, accompanied with its’ upcoming smaller sibling.